Play Tournament Golf On The GOLFWEEK Amateur Tour In 2017! The GOLFWEEK Amateur Tour (Philly Metro) announced its 2017 tournament schedule with events between April 29 and September 30. The schedule includes 12 regular season events, including a 2-Day Tour Major tournament, and two special Monday tournaments, plus the season-ending Metro Cup. The GOLFWEEK Amateur Tour is the largest amateur golf tour in America, with 42 different Local Tours throughout the country. Tour membership is a “national membership” allowing members to play in any of over 600 tournaments nationwide each season, simply for payment of the individual event fee. Members of the GOLFWEEK Amateur Tour are flighted into one of 5 different Flights (Championship, A, B, C, and D Flights) based upon a tour handicap index; members play only against other golfers with the same skill level. Within each flight, competitors play for the lowest total gross score that day, to win VISA gift-cards and crystal trophies; gift card amounts are based upon the number of competitors in each flight during that week’s tournament. Tour handicaps and flight assignments are closely monitored by the Tour President to ensure a fair competition. In 2017, GOLFWEEK Amateur Tour members will also receive a USGA approved handicap index from US Handicap as part of their membership package. Points are accumulated by GWAT members throughout the season, based upon each player’s gross score in his own flight each week, counting towards qualification for the National Championships in Hilton Head, S.C. Each Philly Metro tournament also includes a separate Skins Game, Closest-To-The-Pin competitions on all Par 3 holes, and a 50/50 drawing in support of the GOLFWEEK Amateur Tour’s charity partner, Stand Up 2 Cancer. Some tournaments provide the chance for a scheduled practice round to be played at that week’s venue (for an additional fee) in advance of the actual tournament round. 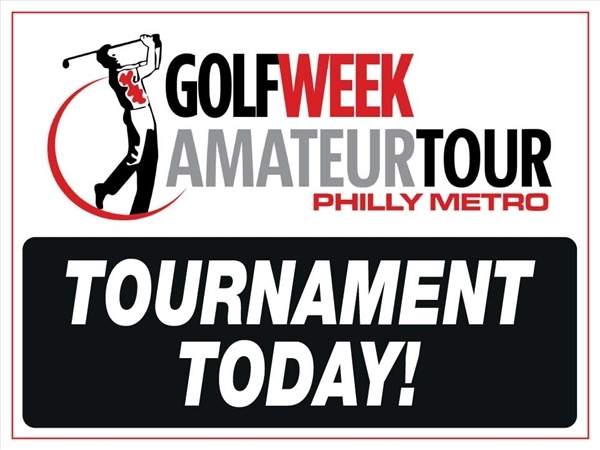 The GOLFWEEK Amateur Tour (Philly Metro) will once again kick off its season with a return trip to The Ridge At Back Brook in Ringoes, N.J. on Saturday, April 29. The Ridge, opened in 2002 and designed by Tom Fazio, is a private course built in the rolling woodlands of western New Jersey. A golf-only facility, The Ridge was named one of the Top 10 private courses in the country, as well as the #1 new private golf course in New Jersey in 2003. Field size is limited, so sign up early if you want to be included for what is sure to be a fantastic season-opening event. The second tournament of the season, on Saturday May 13, takes the tour to White Clay Creek At Delaware Park. This Arthur Hills designed resort course features many challenging holes and a fantastic practice area. The course is set on a beautiful wooded property alongside the wild and scenic White Clay Creek, which comes into play often. This is sure to be a fun event! Our next tournament, on Saturday May 27, takes the tour to private Philmont Country Club (North) in Huntingdon Valley, Pa. This classic Park & Flynn design opened in 1924, and has hosted many USGA qualifiers as well as the Nike (now Web.Com) Tour. The course features some of the fastest green complexes in our area and many challenging holes. It has become a tour member’s favorite, and has hosted us every season. On Monday June 12 we play a special Monday tournament at the historic DuPont Country Club’s Nemours course. This Par 71 private course was opened in 1938 and borders the former DuPont family residence, Brantwyn Estate, which will serve as a staging area for the event. Designed by Alfred H. Tull, the course provides many challenges as it winds through rolling woodlands and fields. We will have the entire club facilities to ourselves for this Monday tournament; additional details to follow. Our Two-Day Tour Major of the season takes place June 24-25 in the Pocono Mountains. Day One, on Saturday June 24, is at Great Bear Golf Club in East Stroudsburg, a Jack Nicklaus “signature design” that opened in 1997. The course winds through mature forest and wetlands and challenges players on every hole. Day Two, on Sunday June 25, is at Shawnee Country Club. Rich in history, this A.W. Tillinghast design opened for play in 1912, and is a throwback to a different era. Located in Shawnee On Delaware, PA, most of the golf course is located on an island in the Delaware River between Pennsylvania and New Jersey. This course will test your short game and all of your shot-making skills. This will be a double-points tournament. All registered players will be eligible for a special room rate on Friday and Saturday night at the Hampton Inn in East Stroudsburg, Pa.
Our next event, on Saturday July 8, is at the private Burlington Country Club in Westhampton, N.J. An Alexander Finley design from 1929, this scenic club is nestled in a country setting, surrounded by horse farms and rolling woodlands. In 2002, Ault & Associates designed and oversaw major renovations to the entire golf course, including the construction of six new greens and a revised layout of the back-nine holes. Water is in play on many of the holes, and accuracy is paramount when hitting approach shots to the small greens. On Saturday July 22, we return to the private Radley Run Country Club, in rural West Chester, Pa. The beautiful rolling terrain coupled with two ponds and a meandering stream provide for a challenging round of golf here. Radley Run has just completed a major course renovation that started prior to the 2016 season. We have been privileged to play at Radley Run almost every season, and it is certainly a member’s favorite! On Saturday August 5, the tour returns to Pottstown, Pa. for a tournament at the private Brookside Country Club, a William and David Gordon re-design from 1959. The club dates to 1919 and has hosted some of the greatest golfers of their time; in 1921, an exhibition match there pitted Walter Hagen and Sonny Fraser against Harry Vardon and Ted Ray. The course features numerous elevation changes, small greens, streams and wetlands, and a great quartet of Par 3 holes. Our next event, on Saturday August 19, is at the private French Creek Golf Club, located in the heart of rural Chester County in Elverson, PA. This exciting Gil Hanse design dates from 2003. The flowing brooks, natural woodlands and several forced carries over “deep stuff” offers a unique challenge for players of all skill levels. On Monday August 28, we return to the private Manufacturers Golf & Country Club in Fort Washington, Pa. This historic Flynn & Toomey design dates from 1925. The Sandy Run creek winds through the golf course, providing a constant challenge. The course features many elevation changes, challenging tee shots, and fast putting surfaces. GOLFWEEK Magazine has twice selected Manufacturers G&CC as one of the Top 100 Classic Courses in the USA. We will have the entire club facilities to ourselves for this Monday tournament, which is a joint-event with the Metro New York Tour. The field is limited so sign-up early! On Saturday September 9, we return to the Jersey Shore for a great tournament at the private Wildwood Golf & Country Club in Cape May Courthouse, NJ. Opened in 1922, and originally designed by Wayne Stiles (a contemporary of Donald Ross), two new holes were added by Ault & Associate in 1995. The course features narrow fairways and small push-up style greens, and breezy conditions can create an additional challenge for golfers. The Local Finals will end the season at the private Old York Country Club in Chesterfield, N.J. on Saturday September 16. Designed by Gary Player and opened in 1995, the course was built on a former estate property and features surprising elevation changes and many unique and challenging holes, with water hazards often coming into play. Old York has been ranked as one of the finest private clubs in New Jersey, and for good reason – it is a thrill to play! This will be a Tour Major double-points tournament and will determine the 2017 Flight Champions. The Metro Cup will take place on Saturday September 30 on the Palmer Course at the private Forsgate Country Club in Monroe Twp., N.J. This qualification event pits 20 players from both the Philly Metro and Metro New York tours in Ryder Cup style match-play over 27 holes. The Palmer Course, although not overly long, is known for its challenging holes, which require precision shot making over water and around numerous wetlands. Originally designed by Hal Purdy in 1961, the course was re-designed by the Arnold Palmer Group in 1995, and has since been updated by Stephen Kay in 2007. The GOLFWEEK Amateur Tour National Championship will once again head to Hilton Head Island, S.C. from October 20-22. This 54-hole tournament culminates the season and welcomes the top qualifiers from each tour around the country. The tournament field includes over 900 golfers from 42 tour cities. It is a tremendous golf experience! "We are truly excited about the upcoming season. Our tournament lineup is impressive; we look forward to playing tournament golf on some of the best private and resort courses the Philly Metro area has to offer" said Brodsky. Visit www.amateurgolftour.net or call the Tour Director at 610-642-7890 to learn how you can become part of the fastest growing amateur tour in our area – The GOLFWEEK Amateur Tour.